Simply laundry detergents are suitable for the whole family, even those with sensitive skin. 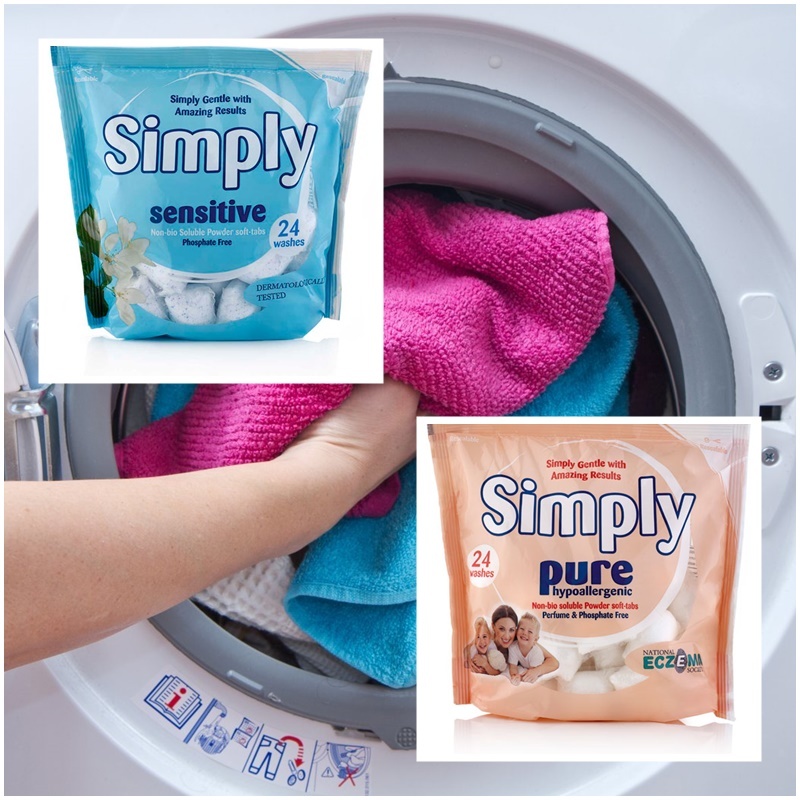 Simply Pure and Simply Sensitive are soft tabs that you place into the draw of your washing machine. When reading the packet it does state to use one but on heavily soiled clothes you can use two. The little soft tabs have a protective film that when in contact with water will dissolve immediately getting to work on your washing even quicker! Some brands can take up to seven minutes until their soft tabs dissolve making a washing cycle not so great at washing your clothes. When using both products to wash clothes i found the soft tabs had completely gone in the draw and i waited to see at the end of the wash if these really do get to work and can efficiently wash any dirt, stains away. You know what its like, especially in a family, when one person plays sport and you have a toddler that seems to find rubbing food into their outfit quite fun. Loading a washing machine with the culprit clothes to find when the cycle has ended, that the outfits are still stained and your left in a washing cycle nightmare of your own. I used simply pure and was amazed on how well these cleaned the clothes and yes, even on a quick cycle! Also what surprised me was on how lightly fragranced the clothes were left with, not over powering or a heavy scent but a clean light fragrance! The simple sensitive i was really excited to use as having sensitive skin i have to be careful what i wash my clothes in. Using a wrong brand can leave my skin itchy, red and just not great at all! The simply sensitive not only clean great and return clothes to a clean wearable state but there is no residue left on the clothes to aggravate any sensitive skin out there, Bonus! The simply range is also environmentally friendly when the water leaves your washing machine and also the packaging can be recycled. The products are not tested on animals. 1. 24 Tabs to a pack which is 24 washes. 2. Excellent results at low temperature wash.
4. No residue left on clothes after wash.
5. A light fragrance that smells inviting. Simply washing is available at Sainsbury's, Holland & Barrett and just recently amazon. Thanks to simply for sending me your excellent washing products to blog about! Now u have no excuse not to wash your own clothes! X Neal.